http://www.youtube.com/aweme (AWE is an acronym for Amaze, Wow, Educate). Swatton, the artisan genius behind the beloved Capital One Viking costumes and props, the Pirates of the Caribbean swords, the Blade from the movie of the same title, and the prop creator behind many blockbuster films, loves to share his work with the fans. “For the first time, I’m publicly lifting the veil on the mystique of it all. Look forward to seeing a lot of blood, sweat, and heavy metal,” he promised. D-I-Yer watching Man at Arms,” said Mitch Rotter, Executive Vice President of Programming, Break Media. Swatton, who was named “Pirate of the Year” for Pirates magazine in 2010, is a renowned cosplay enthusiast and one of the fun-loving founders of the Norse Hollywood Dining Vikings, a Viking flash mob group who invade Ikeas for their Swedish meatballs, or play football games in Viking garb for charity. From his madcap Hollywood adventures to his death-defying blacksmithery, this series is truly unlike anything that’s ever been done on reality TV or webisodes. 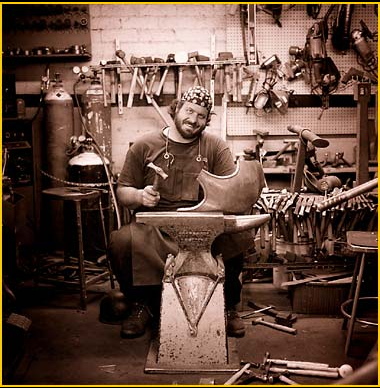 Founded in 1989 by master blacksmith Tony Swatton, Sword & Stone is located in Burbank, CA and has established itself as the trusted source for handcrafted, historically accurate pieces custom designed for the needs of creative directors. The shop specializes in custom-made arms, armor and props for TV, film and the serious collector. They are a full-service blacksmith shop creating only one-of-a-kind pieces—nothing at Sword & Stone is mass-produced. Break Media is a leading creator, publisher, and distributor of digital entertainment content including video, editorial, and games. The company’s properties include the largest humor site online, Break, as well as Made Man, Game Front,Holy Taco, Screen Junkies, Cage Potato, All Left Turns, Chickipedia, and Tu Vez. The Break Media Creative Lab is an in-house production studio creating original videos that range from award-winning branded entertainment to celebrity-driven web shorts to viral one-offs. The Break Media Network represents hundreds of publishers as one of the largest video advertising networks online, reaching more than 200 million consumers each month.